Facebook algorithms are the topic on everybody’s lips these days, am I right? Bloggers, Etsy shop owners, podcasters, and really anyone who uses Facebook to reach their audience have been in a near panic whenever the subject of the new Facebook algorithm comes up. We’re diving into how to beat the Facebook algorithm changes. 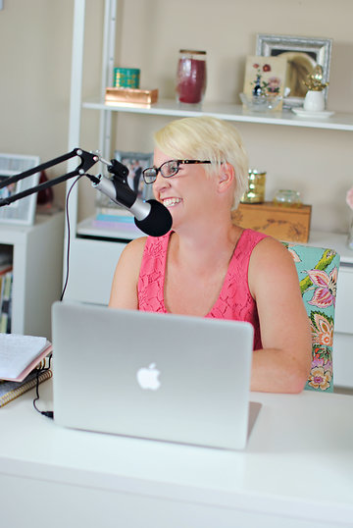 I am stepping away from our series on goal setting today to help you stop the panic and get a game plan together for how you can actually take advantage of those algorithm changes. We never need to panic, friends. We need to understand what we are facing and figure out a way to work within it while still growing our audience and engaging with them. The new Facebook algorithm is being called Facebook Zero. The whole point, according to Mark Zuckerberg, is to have your newsfeed filled with your friends and family instead of a majority ads and pages. As someone who very recently completely missed the pregnancy of a good friend until several months in, I appreciate what he’s trying to do here. I don’t want a news feed filled with only ads and business pages. He is encouraging discussions, not just mindless scrolling. Teach your audience to come to your Facebook page. You have to train your audience to come directly to your page rather than waiting for it to show up in their news feed. When this new algorithm goes into effect, your page is not going to show up in their newsfeed. And you will be prevented from using any type of clickbait titles to get them to click over. Use social media to get to know your audience. When I first got started on Instagram, I could not wrap my head around the fact that it wasn’t for the purpose of driving traffic to my site. Instagram is about getting to know people. And that is what Mark Zuckerberg wants to happen on Facebook as well. Use that to your advantage by giving your audience a chance to get to know the real you! Learn about Facebook ads. If you want your business stuff to be seen on Facebook, you are going to have to learn how to use their ads and pay to play. I know this makes many of you angry, but hear me out. Zuckerberg is running a business and he gets to make the rules. We all want the same thing for our own businesses so we have to be willing to follow the guidelines in order to play on his platform. When you think about your industry, you need to go deeper than just “food blogger” or “lifestyle blogger.” You have to become an expert at curating the best content for your industry. What is your industry? You need to ask yourself a couple of questions to figure this out. If you constantly hear the same few questions from your audience, you know what your specialty needs to be. I have a student who has a food blog who has recently been diagnosed with Celiac disease. She commented to me that she was thinking of creating an e-book down the line. But her audience is always asking her about being diagnosed with Celiac and how to convert their favorite recipes to gluten-free. That’s her specialty! Her audience is literally telling her what to create for them. No matter what type of blog you have, you have to figure out what your area of expertise is and how that sets you apart from the crowd. You need to hone in on what your audience will benefit from by reading your blog. Your content should be specific and highly targeted to your audience. If your content isn’t going to show up in your audience’s newsfeed, you have to find ways to get them over there. One of the best ways I have found is to do Facebook lives. I recently completed a 6-part series on doing live video for your audience. If you go here, you will find the first of the 6 parts. I did these trainings live on Facebook, as well as shared them on the podcast. Showcase your expertise. You should never go live just to go live. Going live should serve a specific purpose. Be consistent. Create a weekly show and stick to the time and day. Your audience will come to rely on you being live on that day and at that time. Tie your video to your lead magnet. Your live show should always link back to your lead magnet in order to help your audience see you as an expert on the topic. Create an event. 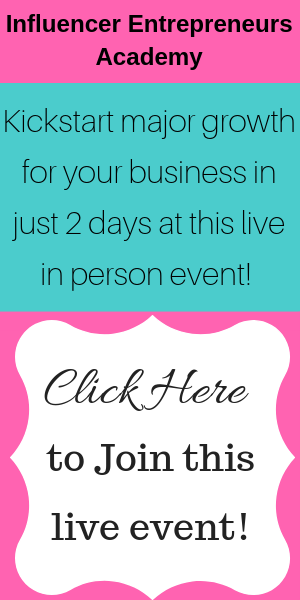 Before you ever go live, you need to create an event on Facebook and heavily promote that event. When your audience sends you an RSVP, Facebook will send them a reminder before you go live. Promote your video. You not only want to promote your video on Facebook but also on other social media channels. Use Instagram stories to tell your followers that you are going live and when. You can email your list before and after the live to get more views. You can share the video in a blog post after you finish by embedding it into the post. Write an enticing description. You can not invite your audience to your live broadcast just by saying, “Hey guys, I’m going live.” No, no, no! You need to write a description for your video that draws people in. Ask a question, create an intriguing title that makes them click (not clickbait), garner their interest by giving a hint as to what you are talking about. If you want to get paid to do Facebook lives, and you totally should be trying to do that(! ), here is what I recommend. Be consistent. There isn’t a brand out there that will work with you if you can’t show them that you have a consistent show already in place. When I go live on the Melrose Family page, I consistently get 4X the reach of a regular post. And let me say that I am not as consistent on that page as I am on my Jenny Melrose page. Every week on Tuesday morning, I go live on Jenny Melrose. And on that page? I get 8-12X the reach as compared to a regular post. If you want a higher reach, go live. And when you are consistent, your audience knows when you will be live and they will come. Tear Off That Band-Aid, Sister. I get it. You’re nervous. You’re scared. Going live seems like some sort of torture and you can’t imagine ever doing it. There’s only one way to get over that. Create a consistent show. This is one of the easiest ways to train your audience to come to your page once every week without fail. If they know you will show up, they will show up. I understand that algorithm changes can be scary. But what we have to do is figure out what our audience needs from us and how can we provide it for them? If Mark Zuckerberg wants more conversation and more engagement, then provide it! Teach your audience to come to you and you will be using Facebook Zero to continue to grow your business. I want to close out by giving you the top two action steps one more time. Have a strong lead magnet. You will never know what works if you don’t try! This week, I want you to create an event, write your video description, and then go live. And then I want you to do it again. And then again. And then again, every week, for the foreseeable future. Or until the algorithms change again. And as always, please comment below and tell me how you see your audience engagement increasing through the use of live video. Plus join Jenny Live every Wednesday at 3:00pm EST and every Monday at 8:30pm EST on Instagram to get your questions answered live! Just request to enter the live stream and you’ll be able to join Jenny LIVE! Want to learn more about the Facebook algorithm changes? Check out this great article by Creative If Writing. Love this Jenny! I was SO scared to do FB Lives but ripped off the band-aid a few months ago and now actually love doing it. It’s been the best way I’ve found to help build community on FB. As a food blogger, we often don’t have that engagement – people will watch our Tasty style videos and see our recipes, but there’s not much for them to connect with. But FB Lives have allowed my audience to see me, interact with me, and get a totally different view. Instead of passive viewers I now have dedicated fans, which is priceless. Dedicated fans are the best!!! They’ll even tell you what products they want you to sell to them! This was done from a bad motive. This wasn’t done for the good of the community. It’s an attempt to block the power of “Influence” because Social Media is a powerful tool that now impacts elections. ………Some hate FREEDOM to think ………These want to “Control the Masses” and what they see. ………..They want to force people to get all NEWS OPINIONS from the same biased corrupt sources. ……..This action was driven by POLITICAL FORCES – who want to control all the Narratives you hear – and therefore blind us to opinions they don’t LIKE. ……..Corrupt people will love this change that blocks caring people from having public platforms. ……….It blocks true internet neutrality. ………It’s GROUP-THINK, 1984 for those who remember the Book! That’s definitely one take, but since most of what they are stating will come into the newsfeed is family and friends, I don’t truly see how that applies to Facebook.